Weekend goodness | Fat girl gone RAW! So many wonderful things have been created in my kitchen over the past few days! I am inspired from meals I have eaten in the past, or from recipes posted by other foodies and chefs. I wanted to share while I had a few minutes! Tacodeli Quesadilla ($ 6.95) Our special veggie mix of carrots, onion, celery, red bell, poblano, zucchini, mushroom and cabbage sautéed to order with olive oil and sherry stuffed in a cheese quesadilla. I wanted a meal without the cheese and tortilla, so I went home and got to work. 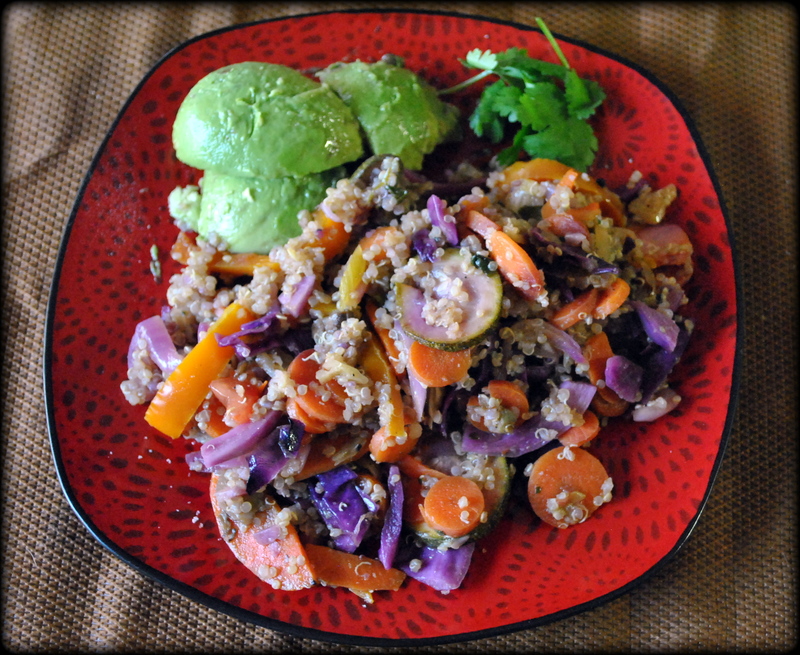 I managed to produce a beautiful veggie stir fry that I served with sprouted quinoa. It was SOOOO good! 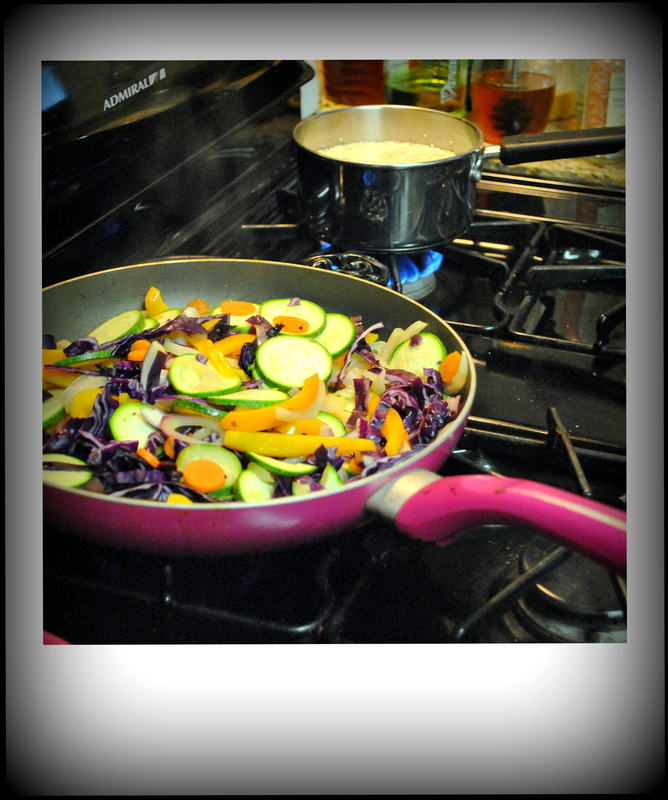 In a large pan, add carrots and cook over medium heat for about 5 minutes. Add remaining ingredients and saute another 5-7 minutes. I prefer my veggies al dente, so I remove them from heat after about 10 minutes total. Add red wine vinegar and salt at the end. Serve over quinoa, sliced avocado and sprinkle with chopped cilantro. I used sprouted quinoa and prepared it using 1 cup of grain and two cups of water. I added 1 teaspoon of Better Than Bullion veggie stock to the water while it was boiling and gave it a quick stir. Quinoa is a popular food for because of its standout nutritional value. It’s so easy to prepare – ready in less time than brown rice – and it contains a much higher protein content than grains and has many essential amino acids! One cup of cooked quinoa contains about 150 calories, 30 grams of carbohydrates, six grams of protein, and two and half grams of fat. I bought the sprouted, organic quinoa at Whole Foods for about $3.50/pound! I hope you’ll try this meal – it was so easy to make and really gorgeous! I also made some amazing tea tonics and smoothies this week, and I’ll be sharing those recipes next. Until then – happy weekend, everyone! « Keep it simple! Plant strong soups and lunch ideas.